Way Back Then – or Was It? Sweet Disorder, my current WIP, is set in Sussex. 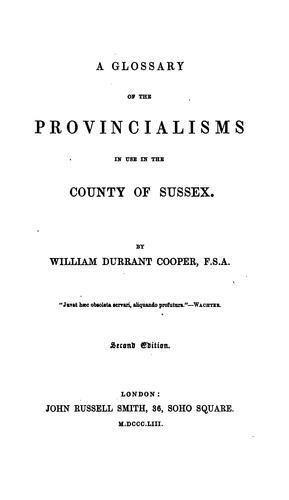 As part of my research I read A Glossary of the Provincialisms in Use in the County of Sussex by William Durrant Cooper, first published in 1834. I had it printed at Third Place Books on their espresso machine. The guy who worked there did a whole comedic bit: "Why don't we stock this all the time? We really didn't have this on the shelves?" The quote says "Juvat haec obsoleta servari, aliquando profutura. --WACHTER." Any Latin speakers out there want to translate? "DALLOP, s. A packet or lump of tea, weighing from six to sixteen pounds, so packed for the convenience of smuggling." "JUG, s. A nickname given to the men of Brighton." And look at this: "BARTON, s. A yard or enclosure near a house." Barton Cottage, anyone? There are a lot of words, too, which were regionalisms at the time and have now entered into the common language: "bosky," "bumptious," "cosy," "fogey," "frumpy," "gallivanting," "grumpy," "moonshine," "nudge," "ramshackle," "skinflint," "slam," "a to-do," "transmogrify" (! ), and more. And look at this: "DIBS, s. The small bones in the knees of a sheep or lamb, uniting the upper and lower bones of the leg: a game is played with five of these bones." Is this the origin of "I call dibs"? Apparently there are also many similarities linguistically between Sussex dialect and the English of the American South! Cf. the use of "be" as the conjugated form of "to be" or "CRACKLIN, s. The hard skin of roast pork." "ARGUIFY, v. and adj. Signify, argue. To import, have weight in an argument." I really wish there were more usage examples in this book! I imagine this being used in a sentence something like this: "Clark Kent wears glasses, which arguifies that he cannot be Superman." "BONKER or BUNKER, v. [Bon coeur, Fr. Good heart.] To outdo another in feats of agility, such as to jump better over a gate, ditch, wall, or hedge, a good heart or courage being neceassary." I'm glad he gave so many examples of things you can jump over! "CARP-PIE, s. To eat carp-pie, is to submit to another person's carping at your acts, &c."
"CHAVISH, s. A chattering of many birds or noisy persons." "DUNNAMANY and DUNNAMUCH. [Corruptions of I don't know how many or much.]" "FLUTTERMOUSE, W.; FLINDERMOUSE, E.; FLITTERMOUSE, E., s. [Fledermaus, G.; Vliddermuys, Du.] A bat." The W means West Sussex and the E means East. I know that Fledermaus is just the German word for bat but I still find the word "fluttermouse" so precious. "GAPESEED, s. A passing object to stare at. A servant staring from a window is said to be 'sowing gape-seed.'" "LAWRENCE, s. A kind of imaginary saint or fairy, whose influence produces indolence, thus, 'I caunt get up, for Lawrence ha'e completely got holt an me,'--"I ha'e got a touch o' ol' Lawrence to-dee; I be troubled to git ane wud me work.' This person is also known in Dorsetshire, &c."
"MOCK-BEGGAR HALL, s. A house which[...]has an inviting external aspect, but within is poor and bare, dirty and disorderly, disappointing to those who beg alms at the door." "MUCH-OF-A-MUCHNESS, and MUCH ONE. Much the same; with little or nothing to choose between." "SLAPPEL, or SLAVVEN, s. A large piece. Synonymous with hunk." "SNACK, v. [Snacken, Du., a match.] To share or be in partnership with. 'We'll go snacks;' i.e., 'We will divide.'" "SNOOZLE, v. To lie close together; to nestle; to cuddle; to hide the face in the bosom, as children do." "WHILK, v. To howl like a dog, S. To mutter to one's self, as a person does when offended. E."
If you could bring one word or phrase into common usage, what would it be? This post made me incredibly happy. Especially transmorgify. It tickles the tongue. Love your post, as usual, especially your example for "arguifies." LOL, all the "Bonker" examples! It's like he thought the reader might be confused: "Okay, I get that you'd say 'I totally bonkered you in jumping over that gate'... but what if you were jumping over a HEDGE?" Wait, I use “much-of-a-muchness” … and how do I find a place to print out Google Books?!!! Oh, my poor pocketbook. Oh, god, I am in so much trouble … my book budget for 2012 just blew up in my face. I don't know which of the words to include. I'd like to add all of them to the language. I love language itself and find these would be great additions. Saranna--thank you! I LOVE the word transmogrify--I think I first heard it in high school because Fitzgerald described his Rubaiyat of Omar Khayyam as a "transmogrification." I think "inspired by" might have been more accurate but I was immediately in love with the word! Alyssa--ooh, thanks for the translation! Cecilia--Cat burglaring? Snowboarding out of helicopters? Isobel--I LOVE "much-of-a-muchness"! Is is something you've heard around, or something you picked up from old books? And yes, the Espresso machine is ADDICTIVE. Luckily Third Place Books is at least across town, which helps me resist the impulse a LITTLE. Renee--thanks! Heh, I wasn't very clear, I meant words or phrases in general, not just out of these. Ones you wish would come back into use, ones you made up with your friends, whatever! My dad says it. I didn't realize other people don't. I do tend to have a strange vocabulary though. My BFF likes to tease me about using “SAT words”. I sometimes get that from co-workers. I have to admit, I don't really enjoy that kind of "gentle ribbing"--it just makes me feel self-conscious. I won't make fun of how you talk if you don't make fun of how I talk! I have a lot of sayings and stuff I adopted from my mom too, some more idiosyncratic than others. Unfortunately a bunch of them are Yiddish and wouldn't make a shred of sense to most people I talk to so I don't get to use them much, even when they're the only way to express what I mean!